Firstly let me say how honoured I am to have been asked by the Family and Friends of Martin and Joe to come and here today and speak. The fondness in which Martin & Joe’s friends speak of them is touching, they speak of warm, witty and determined people, men who loved their country immensely, two men who touched the lives of so many in their community. For many Martin Rattigan is the epitome of old school Republican, he travelled the length and breadth of Ireland campaigning, on his travels he picked up many friends and acquaintances and nowhere outside of his home town was Martin so well-known and loved as in County Armagh. Martin operated as an IRA volunteer in South Armagh for many years, during his time spent there on behalf of his country, Martin developed a great affection for the place, he referred to Slieve Guillion as “my little mountain”. At the beginning of whats referred to as the troubles, Martin was part of an active service unit, made up of mainly Navan Volunteers, he was billeted in Iniskeen when the unit heard word that British Soldiers had blew up the road at Courtbane, the unit took up position on the road and an ambush followed, it was here that the first British Soldier of the campaign in South Armagh was killed. Martin was involved in many IRA operations in subsequent years, based mainly around Portadown and Lurgan. After ending active service Martin was to continue his Republican activism, throughout his life he campaigned for Republican prisoners and was involved in the Cuban 5 campaign, a keen internationalist Martin also made important links with the Basque Separatists. Joe was equally as active in campaigning on Republican issues, his friends describe him as “Martin’s right hand man”, Joe sold Republican papers religiously to try and get the word out, and he did whatever was needed. The esteem in which these two men are held is evidenced here today, the very many of their friends who have come out to commemorate them, and their family will never allow their memory to be forgotten. If Martin and Joe where alive today, I have no doubt that they would be to the forefront of the very many campaigns Republicans are currently fighting. One of those very serious issues is Internment. 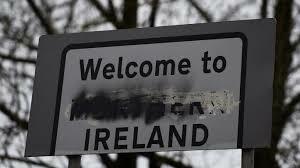 Internment or Licence revocation as the Brits are calling it, has become a very worrying trend in Irish Republican circles, at present we have 3 men, all in Maghaberry Jail who are subject to this. In the case of Tony Taylor who has now been in Jail for nearly 2 years, no acceptable reason has been forthcoming, citing a generic “risk to security” is not a reason, it is an assumption and not a fact, it is not a strong enough assumption to take away someone’s liberty. The same goes for Gabriel Mackle released only a matter of weeks and thrown back in Jail, once again a mantra of being a “security risk” is all we know. Having secret reasons given by a secret police in order to deprive someone of their liberty is the stuff of tyrannical despotic states that decent society is allegedly supposed to oppose. 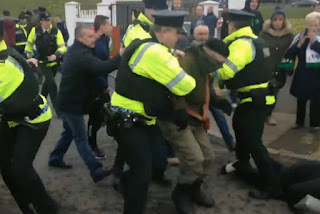 The most shocking of these 3 cases though it has to be said is that of Neil Hegarty, Neil was released from Jail in December after serving a 5-year sentence; Neil was welcomed home by his family and friends and was undoubtedly looking forward to reconnecting. With Christmas only a matter of weeks away, his friends and family were elated about having him back at home, the first time in 5 years they would socialise together, enjoy a meal and have quality time with their loved one. Just over 24 hours after his release the Police arrived at Neil’s door, told him his licence had been revoked and carted him off. In the 26 counties we have an onslaught of IRA membership charges being brought against Republican activists in an attempt to censor them, to hamper the good work they are doing. Any Republican can be arrested and charged with IRA membership, all it takes is the “belief” of a Chief Superintendent. No evidence need be provided just simply the “belief” of one person. And we all know that these Chief Superintendents are hardly the most reliable of witnesses, given the atrocious track record of the Gardai of telling lies and setting people up. When the charged person eventually gets to court; and the Superintendent is questioned on their “belief” they have in the past used privilege, in other words, secret information. Essentially you can be arrested, charged and convicted of IRA membership without having any specific allegation or evidence ever given to justify it. All this is supported by the Governments and a willing media. The propaganda and media bias against the Republican people of Ireland means that the Public are completely apathetic about these human rights abuses, so it is our duty to inform them at every opportunity. In recent years we hear people constantly talking about how to make republicanism relevant, how we as “alternative” republicans must somehow change ourselves and our ideology along with it, to those people we state clearly that we are not alternative Republicans, there is no alternative Republicanism, we stand by the Republic as laid out in the 1916 Proclamation. 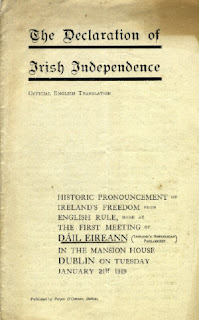 One hundred years ago Irish Republicans took part in the first sitting of an all Ireland Dáil Éireann. On the same day volunteers of Óglaigh na hÉireann struck the first blow against the crown in the Tan War. Both are seminal moments in Irish history and both are still an example and inspiration to Irish Republicans. The Irish Republic is the embodiment of the sovereignty of the Irish people past, present and future. It is what countless generations gave their lives and liberty for. It cannot simply be a passing piece of rhetoric, we as republicans must act towards its re-establishment. What we must also do however is face reality, we are at a critical time in our history, The challenges we face are real and the British and Freestaters are certainly winning the war of “hearts and minds”. Martin Rattigan knew only too well when it was time to face reality, as a member of the Provisional movement for many years, he gave them his all, and he worked tirelessly believing that their plan was a new way, a chance. However Martin like so many others realised, that PSF had went down the path of reformism and revisionism, a testament of Martin’s character was his courage and strength, his ability to put ego to one side and say enough is enough, he walked away from the movement he had dedicated his life to. He put his Country before pride. Martin demonstrated a political maturity that surpasses what many people are capable of, it would have been easy for Martin to stay with them, to see out his days quietly, to not rock the boat, but Martin was a man of integrity and honour and when he realised that PSF had actually become part of the problem, that they were in fact propping up British rule instead of trying to end it, his mind was only on the cause of the Republic and nothing else. The lesson that we can all take from Martin and Joe is that it is never too late, you are never too old to do service for your country, that as Republicans we must always follow the cause and never the man.